Summer on the coast. © Pat Paquette, 2012. With Mercury direct and gathering speed, life is returning to some semblance of normalcy – whatever normal is. Insofar as the “new normal” is fast, unpredictable, and crazy, we’re now back in the groove. My astrology software is working again, after the fourth reinstall. According to the conventional interpretation of Mercury retrograde, anything you have to re-do is supposed to go faster and better while the communications planet is moving in reverse (what it looks like from down here). This most definitely was not the case for re-installing my astrology software – which, you have to admit, is a very fine joke by the Trickster. Too bad I’m not laughing. In fact, I was close to tears when the program kept crashing every time I tried to reinstall my customization files. Maybe the order mattered. Whatever the mystery was, it was solved after Mercury returned direct. Some of my customization work was lost for good, but the most time-consuming modifications have all been restored and I can begin fulfilling the backlog of reports. As I mentioned in last week’s forecast, I also succeeded in reconstructing my astrology documentary pitch. The work itself actually did move along fairly quickly, but Mercury had to have his due, and he got it in spades through all the accompanying tasks, such as downloading software from Apple. The company advertises that you can get apps with one click of the mouse. It took me three days and hundreds of clicks – not to mention hours on the phone with tech support – to get a 20-minute download. The whole experience was interesting in that it reaffirmed the conventional wisdom that if you absolutely can’t wait and have to do something not advised during Mercury retrograde, you can get it done. It just will take a lot longer and deduct a few years from your life. We also now have a complete Republican presidential ticket, with the announcement Saturday morning of Wisconsin Congressman Paul Ryan as Mitt Romney’s VP. I had to wonder whether they timed the announcement with the help of an astrologer (after all, Ronald Reagan had one). The Romney team created a phone app especially for the announcement. The move obviously was intended to draw in younger voters, but it’s also interesting to note that it was an appropriate way to announce the pick of Ryan, an Aquarius. The announcement was made at 7:08 a.m. on Saturday, with the Moon at 7°22′ Gemini. They might have been thinking that Saturday is typically a slow news day and the announcement would be sure to make headlines. But if they’d revealed the information the previous Saturday, it could have been disastrous, with Mercury retrograde. The Moon in the sign of communications not only was a good choice for a news announcement, but later in the day, the Moon conjoined Jupiter in Gemini, which currently is in Romney’s first house. Moreover, the Moon makes a grand trine to planets in both politicians’ natal charts. It’s hard to believe this was an accident, unless you view it as a cosmic message. I’ll leave it to you to determine what that might be, as I vowed to leave politics alone after getting flamed for writing that the 2009 Inauguration Day chart suggested McCain and Palin might win. Incidentally, the birth time being used for Ryan was first reported by The Political Astrology Blog in mid-June. The post says only that the time was found on an uncertified copy of Ryan’s birth certificate, without saying who saw it and under what circumstances. The reporter in me needs to know sources, so I have to issue a word of caution that this birth time is unconfirmed. If anyone has additional information, it would be helpful for the astrology community. Looking at this week, there are three standouts: the Mars-Saturn conjunction on Wednesday, the cardinal T-square with Venus on Wednesday and Thursday, and the New Moon in Leo on Friday. Mars and Saturn in ancient times were considered the malefics, and this combination for sure doesn’t inspire images of rainbows and unicorns. But have a look at the New Moon chart, and you’ll see that the Sun and Moon make quite a nice trine with both Saturn and Mars, and it’s nearly exact. Although I don’t advise running with scissors, I do think you can get a lot of work done, be it relocating your office or making headway in a key relationship. Rather than trying to hash out details over the phone or even over a glass of wine, you may have much better success by doing something fun together, like mountain biking or taking the kids on a trip. The challenge here is to resist sitting on repressed anger, which can come out in hurtful ways. Another possibility that I see in this configuration is addressing wounded male energy. For the past couple of decades, we’ve focused a lot of attention on the return of the goddess and healing our wounded feminine side. That has applied to men and women both, and it’s clear that the balance must be restored between the sacred masculine and feminine. However, we also need to acknowledge that the divine masculine is wounded and needs healing. With a flowing trine from Mars and Saturn in the sign of balance to the Sun and Moon in the sign of the heart, there’s a unique opportunity here to open our hearts to a deeper truth. On Wednesday and Thursday, Venus in Cancer forms an opposition with Pluto in Capricorn and a square with Uranus in Aries. In the midst of nothing less than a breakdown of society as we know it, staying in our comfort zone is next to impossible. That’s the bad news and the good news. Breaking through to new ground by definition means stretching beyond what’s familiar and easy. The quincunx from Mercury to Pluto further suggests discomfort when we discover facts and insights that make it impossible to stay in a state of denial. The “out” in all of this is Mercury in Leo, representing humor and play. It’s hard, when so much seems to be at stake, to not take ourselves so seriously. As for me, I’ve got a hair appointment scheduled for Friday. Only a miracle could transform my baby fine hair into a Leo mane, but I expect to come out of the salon looking gorgeous. 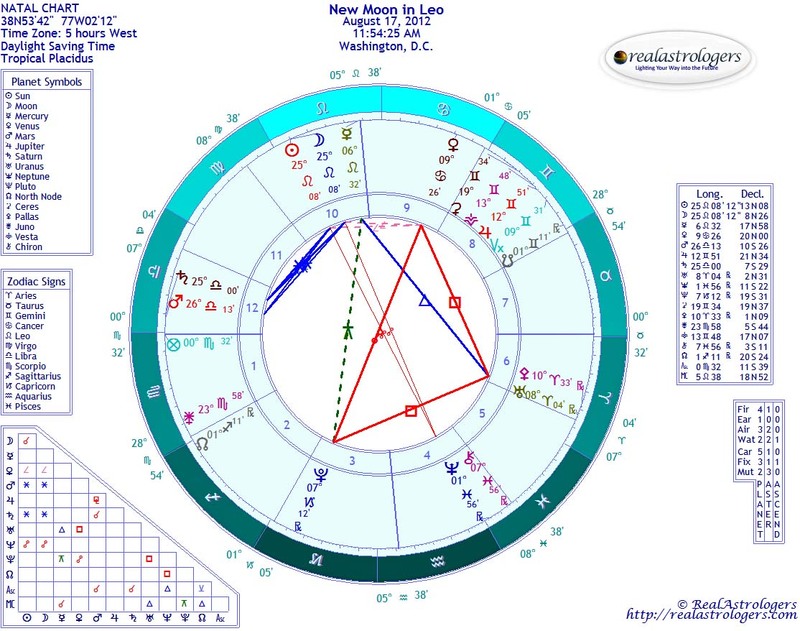 This entry was posted in Forecasts and tagged Mercury direct, New Moon in Leo, Uranus-Pluto square on August 12, 2012 by Pat. Interesting…my astrology software broke on Saturday and is still broken.